~We will NO longer be taking naps at school. Please make sure your child is getting plenty of rest. Several students have fallen asleep in class this week. ~Please make sure your child eats breakfast. Our lunch time is 11:25, and we do not have a morning snack. ~If your child is sick or running a fever, please keep them at home. ~If your child has a fever, they cannot come back to school until they are fever free for 24 hours without taking any medications to reduce the fever. ~P.E. Days are Wednesday and Thursday. Please make sure your child wears tennis shoes, or has a pair in their backpack. 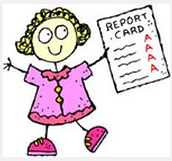 Report cards will be in blue folders today. They are inside a large, brown envelope. Please keep all papers inside the folder, sign the folder, and return to school on Friday. If your child's report card is not in a large, brown envelope, I did not get the folder back from the first nine weeks. However, all papers will be stapled together in your child's folder. If you have any questions or concerns, please let me know! Please practice daily! Students will be responsible for recognizing and reciting all sight words.